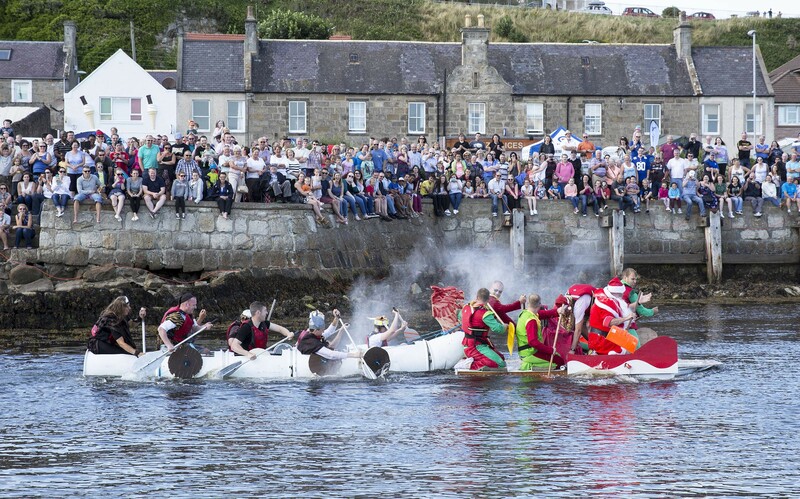 RAF Lossiemouth's raft race will make its return this year, after last year's event was called off. One of the largest military operations in British history will provide vital inspiration for another battle this weekend – the annual Lossie Raft Race. Hundreds are expected to turn out to cheer on the annual spectacle at Lossiemouth’s East Beach tomorrow. Teams entering the competition this year have been asked to forge their crafts in tribute to the Battle of Britain, the World War II air campaign during which RAF heroes drove invading German Luftwaffe from the skies above the UK. To mark the 75th anniversary of the offensive, rafters will adopt the operation as a theme for their crafts and costumes. Already 15 squads of costumed competitors have confirmed they will take to the tides to vie for the toilet seat trophy. The event is organised by Moray Council and RAF Lossiemouth, and though teams from the airbase joined the contest last year it was won by rafters from the seafront’s Steamboat Inn. Manager of the pub and restaurant Emma Phillips, said: “The race is usually a busy event, and it always makes a good day out. As well as a trophy going to the winners of the race, prizes will be awarded for the best team costume and best raft. Gates open at noon, with the race beginning at 2pm, and there will be numerous stalls and activities on offer. Teams looking to make a late entry into the race should visit www.raf.mod.uk/raflossiemouth/events.